Cuito Cuanavale is Angola’s Gettyburg, its Dien Bien Phu, the great nation-making battle. The biggest tank battle on the African continent since World War II’s El Alamein, Cuito Cuanavale is the battle that broke Apartheid South Africa. On one side was the Angolan army (FAPLA) supported by thousands of Cuban troops; on the other, the rebel group UNITA and hundreds of South African conscripts. And since this was the Cold War, Angola was supported by Soviet money and materiel; South Africa and UNITA operated under US sponsorship. In Angola’s far southeastern province of Kuando Kubango, Cuito Cuanavale was an otherwise nondescript spot on the map but after an attempt by FAPLA to destroy UNITA in the town of Mavinga, a South African counter-attack drove FAPLA 200 kilometers back to the high ground above Cuito Cuanavale with the Cuito River protecting FAPLA’s flank and rear. The airstrip in Cuito Cuanavale allowed for rapid re-supply and convoys of hardware pounded down the road from Menogue. FAPLA and the Cuban army, at the orders of Fidel Castro himself, decided to hold the line at Cuito Cuanavale and the mine-laying began in earnest. 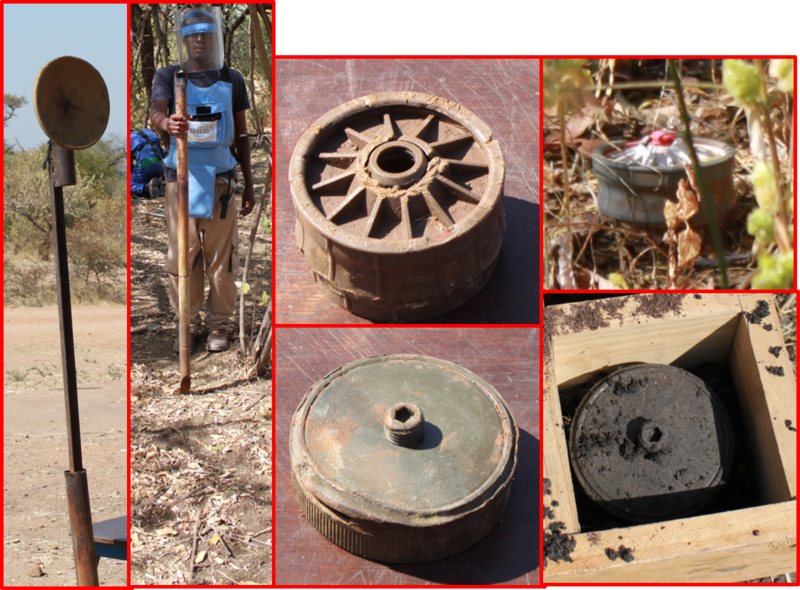 There is perhaps a greater concentration of anti-tank mines here in Cuito Cuanavale than anywhere else in Sub-Saharan Africa. 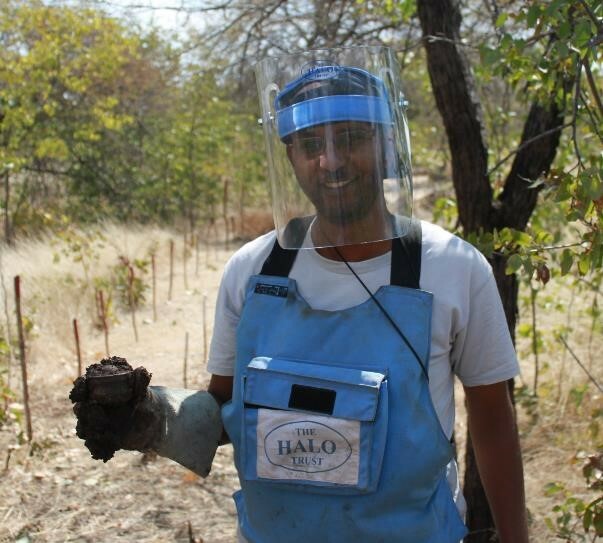 The HALO Trust has been clearing landmines from Kuando Kubango province since 2002 and from Cuito Cuanavale since 2005. Throughout Angola, HALO has cleared about 90,000 landmines, of those 50,000 came just from Kuando Kubango and of those 30,000 came from Cuito Cuanavale. Cuito Cuanavale deserves its title as the most mined town in Africa and it was the next spot on our itinerary. To get to Cuito Cuanavale and the HALO Trust working area, we flew from Malanje to Menongue, the capital of Kuando Kubango. In Menongue we met with the vice governor and the local CNIDAH office. The governor thanked the donors for their support and admitted, “There’s still a lot to be done,” to clear the remaining mines. The provincial coordinator for CNIDAH showed us the operational map for the province. They use the map to monitor the activities of the operators, including government agencies, national NGOs and international NGOs. The office documents demining, risk education, victim assistance and landmine accidents. In 2015, just under 3 million square meters of land was cleared, removing over 4,000 mines and 2,000 pieces of UXO. 7,000 people received mine risk education and another 7,000 received some victim assistance services (with a population of just over 600,000, that means 1% of the province received victim assistance, a staggering total that I will be following up on). There were also five landmine accidents which injured four people and destroyed one vehicle. In 2013, there were 13 accidents which left one dead and eight injured. From Menongue, we took a short hop flight to Cuito Cuanavale where the airstrip had been rebuilt to accommodate the annual celebration of the battle of Cuito Cuanavale on March 23. Of course, the drainage around the new airstrip wasn’t done properly and during the first big rainstorm the run-off took out HALO’s camp, a couple of houses and the local church. The drainage has been fixed and HALO’s camp has been re-located outside of town, next to the massive water and energy plant. In HALO’s map below the town name is at the end of the same airstrip and the minefields are marked in green (for cleared minefields) and red (for fields yet to be cleared). The HALO team, led by Tony and Gerhard, showed us around Task 320, a minefield laid by the Angolan army after the battle. Before the tour began, we had to don protective gear and sign the guestbook, which also recorded our blood types. The task is nearly all anti-tank landmines with some anti-personnel mines as “keepers” to keep the anti-tank mines from being lifted. Similar anti-tank mines had destroyed three South African tanks that are now the highlights of the tour of the battlefield. Task 320 consists of two rows of mines between which the local villagers have started cultivating cassava. There are paths that traverse the lines of mines from the small collection of houses down to the river. In 1999, a person crossing the minefield triggered a mine and later died at the hospital in town. By clearing the minefields, forty families will benefit, directly and indirectly, from increased agricultural land and safe passage through the area. The minefield itself is nasty, no other word for it. There are hundreds of anti-tank mines in the rows, some with anti-personnel mines nearby, many without. Fortunately only a handful of unexploded shells have been found in the area, leaving most of the clearance fairly uncomplicated. The sandy soil is easy to excavate as well. But there are just so many of them. In the picture below there are nine and many more just beyond. The anti-tank mines are not destroyed immediately as doing so would spread metal fragments throughout the site. Fortunately, the weight of a human being won’t set off these mines so leaving them in the ground for a few days is not a problem. The anti-tank mines are clearly marked and usually the sand is put back over them to reduce any temptation to tamper. At the end of the month, all of the anti-tank mines will be destroyed in a couple of days, leaving rather big holes. Anti-personnel mines are destroyed the same day they are found. Angola is home to Africa’s first female billionaire, Isabel dos Santos, but the majority of the people are on less than $2 per day. The people by the minefield would probably feel like they hit the lottery to see $2 in a day. Hardscrabble, eeking out an existence by subsistence farming with minefields limiting their ambitions. But life goes on here. The few families in the community (one could not call it a village) came out and greeted our party (which between the deminers, the local administrators, the Angolan soldiers and us, easily outnumbered the community members). Just across Cuito River from this community is the new airstrip, a new hotel, Chinese-run utility plants and the massive new battle memorial. But the only visible investment in this community is the corrugated roofs, which the community members hold in place using Soviet recoilless rounds scrounged from the battlefield. This task will be completed by the end of August. At that time, HALO will need to assess its financial situation and decide how to proceed. Kuando Kubango province won’t lack for mines if HALO chooses to continue to work in Cuito Cuanavale or elsewhere in the province. 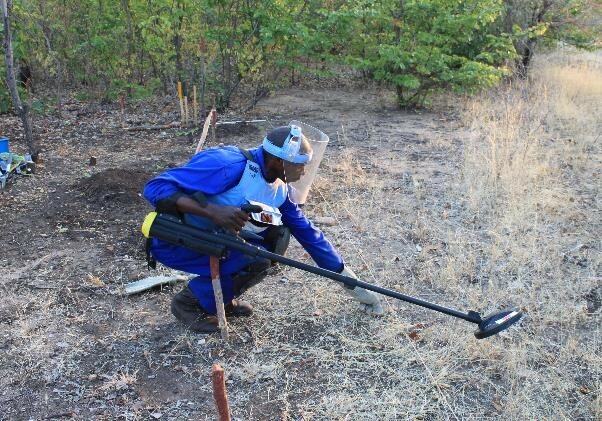 Only the first 40 kilometers of the road to Mavinga have been cleared; in that span 50 minimum metal anti-tank mines were found and dozens more would likely be found if one went looking. South African laid minefields, which covered the retreat of the South African army from the battle of Cuito Cuanavale, make up a 30 kilometer-long barrier to the east of the town. 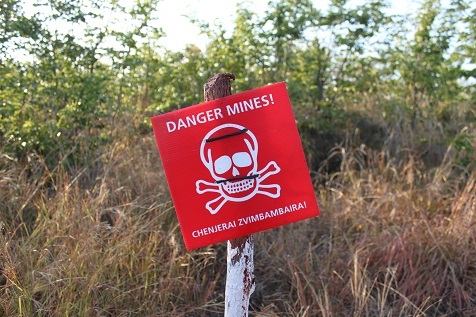 Beyond Mavinga, minefields can be found all the way to the Zambian and Botswanan borders. And these minefields are linked to just a brief period, maybe a year or so between 1987 and 1988, of Angola’s forty years of wars. 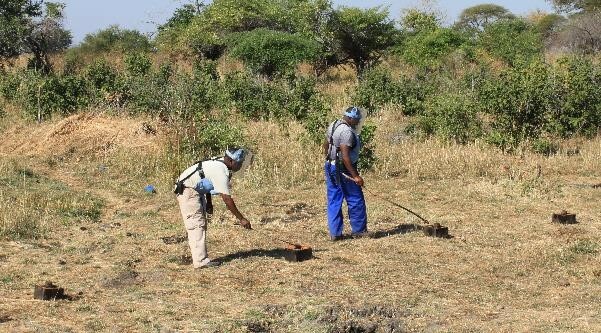 HALO has had mine-clearing activities in four provinces: Kuando Kubango, Bié, Huambo and Benguela; and survey work in Kwanza Sul and Huila with plans to survey Namibe and Cunene provinces. Those provinces have their own particular histories and related landmine contaminations. The urban areas have been the focus of demining and the rural areas, like the community pictured above, will be the last to benefit. In other words, those whose lives would be immediately improved by additional farmland and safe paths, are still waiting and will continue to wait without additional support for groups like the HALO Trust. The battle ended nearly thirty years ago, and every March 23rd, the great and the good of Angola come to Cuito Cuanavale to celebrate it. For the other 364 days of the calendar, the people of the minefields should be remembered and assisted. During my recent visit to Zimbabwe I had the incredible opportunity to accompany the HALO Trust to its worksite on the Mozambican border, a four hour drive from Harare. With a team of 150 people, many of them locally-hired deminers, but also a large number of experienced deminers who had cleared mines in Afghanistan, Lebanon, the Falkland Islands and elsewhere. There is also an all-female section of deminers. 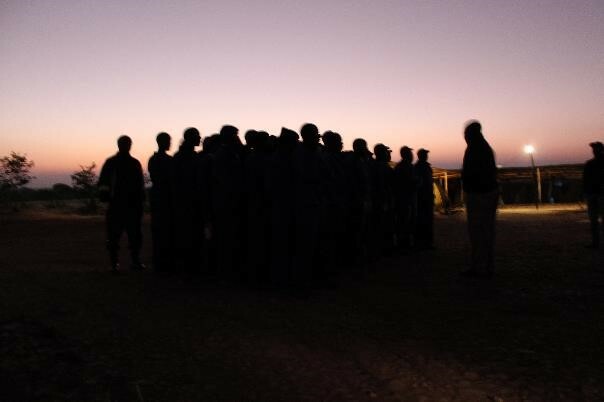 Each month the team works 22 days straight and then has eight days off; almost all of the team lives in one of two camps (some of the locally-hired crew go home, but for the first several cycles even the locally-hired deminers stayed in camp). The team starts early and works in 30 minute shifts followed by 10 minute breaks to help maintain concentration. 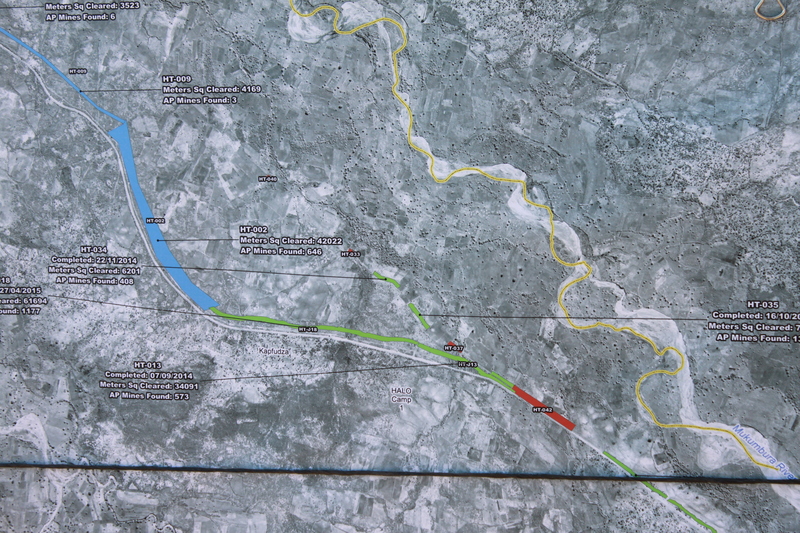 Mine clearance in this part of the country is simplified by the fact that most of the mines were laid in a very regular and predictable pattern as seen below. 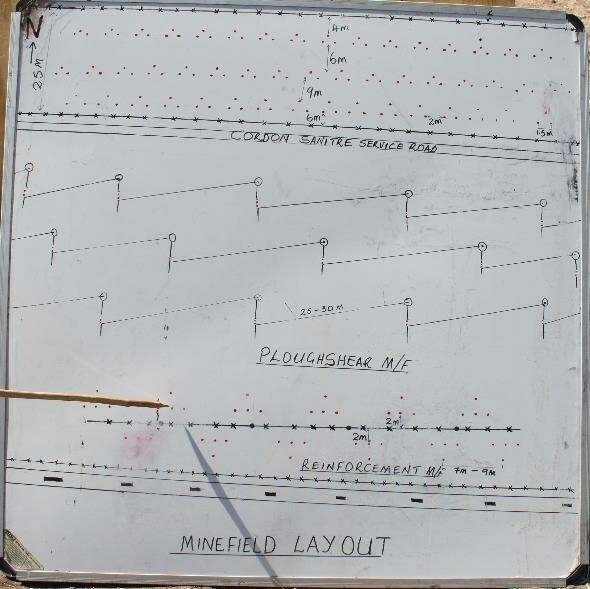 In 1998 – 2000, Koch MineSafe cleared the Cordon Sanitaire minefields (at the top of the picture) and the two rows of Ploughshares (a directional fragmentation mine placed upon a stake at roughly head height) closest to the Cordan Sanitaire. That left the reinforcement minefield and the row of Ploughshares closest to the reinforcement minefield. In the middle of the reinforcement minefield, marked by the solid line with “x”s on it, was a barbed wire fence. All that remains of the Ploughshares and the barbed wire fence are the stakes in the ground that held the mines and fence posts. 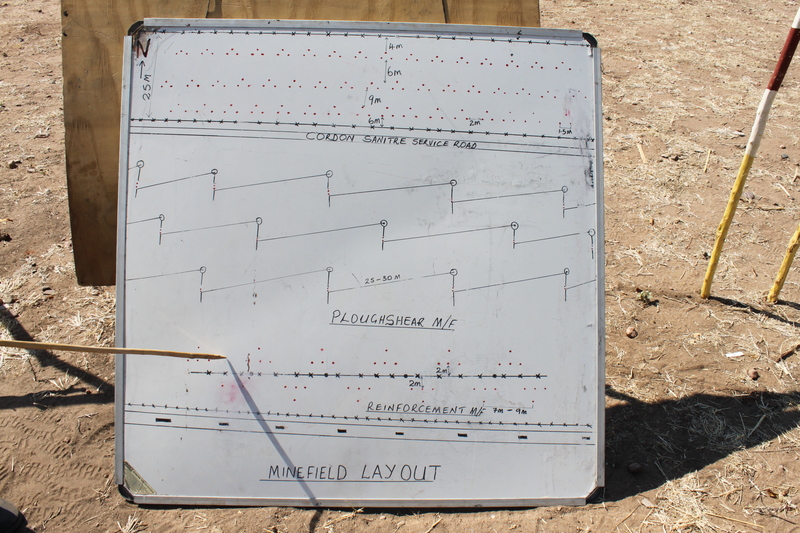 These stakes help HALO determine where the mines are because the mines really do follow the pattern in the diagram. HALO found these four mines (the white stakes show the location of cleared mines) in the exact pattern described by the Rhodesian mine layers; when the team finds one mine, they can generally predict the location of the rest. 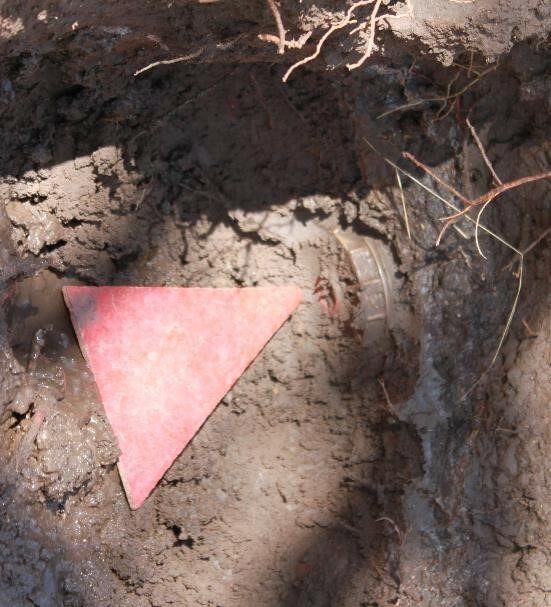 Finding the Ploughshares stakes also helps as each Ploughshare was protected by two “keepers,” anti-personnel mines that prevented tampering with the Ploughshares. Through fires and animal accidents, all of the Ploughshares have been detonated but many of the stakes remain. 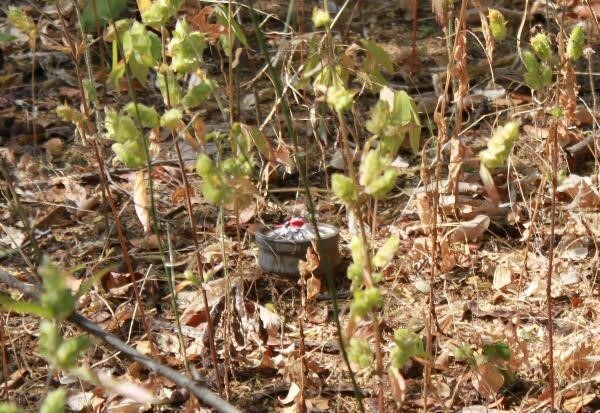 Despite the relatively good conditions for landmine clearance, a lot of work is needed because most remain buried and covered by underbrush. A few mines have been found on the surface, like this one, but they are rare. The work day starts very early with a morning reveille and parade to go over issues and remind everyone to take care. The day I arrived a deminer had been bitten by a snake so the next day’s reveille was an opportunity to tell the team that he was fine and would be returning to work soon. 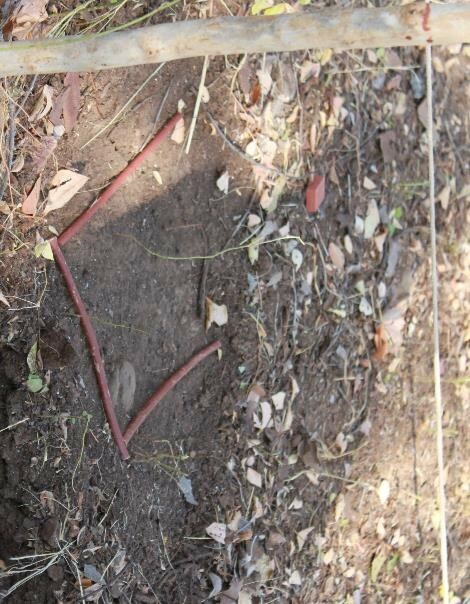 In the field, the deminers mark out their work areas using red stakes and string. Some work horizontally (covering several meters of width and less than a meter depth), others work vertically, one square meter at a time. In this photo, the deminer is sweeping a horizontal work area with a metal detector set to the highest level of sensitivity. Before he could start the sweep with the mine detector, he first had to clear all of the brush, bushes and trees from the area. The wooden tab is then “boxed” in and the deminer preps the ground for digging. 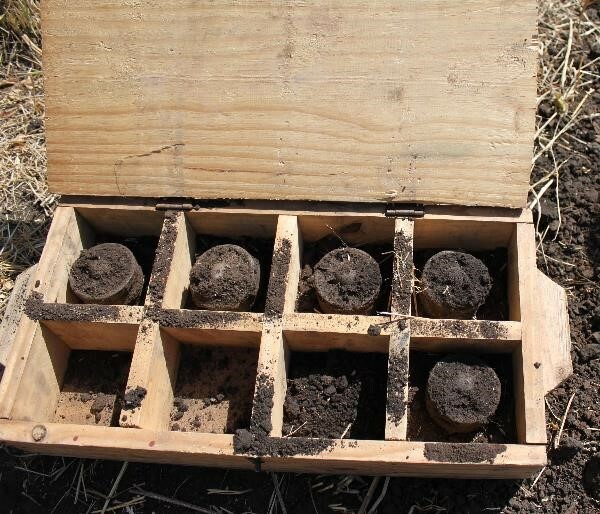 The deminer then digs out the ground in front of the “box” to a depth of 20 centimeters. This is the depth required in HALO’s standard operating procedures and corresponds to the maximum depths at which HALO has found buried mines in this area. In areas with lots of metal contamination (like where a Ploughshare exploded and the shrapnel has spread out), the deminer may need to fully excavate the work area because the metal detectors cannot identify a single signal. When a mine is found, the deminer will mark the location using a red area and call over one of the section leaders. Because of the instability of the South African landmines that the Rhodesians used, section leaders are responsible for “lifting” the mines from the ground. All cleared mines are then collected in a safe location for destruction later in the day. 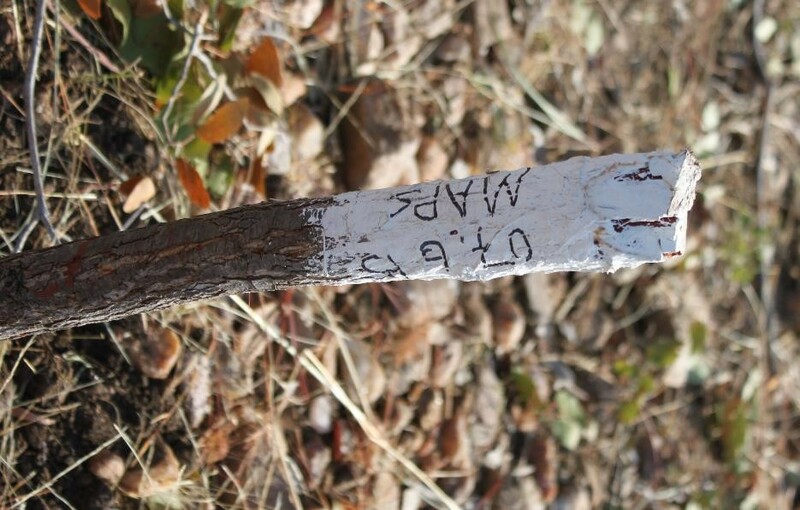 Once a mine is cleared, HALO places a white stake where the mine was found. Each white stake lists the date the mine was cleared, the type of mine found and the depth of the mine below the surface. 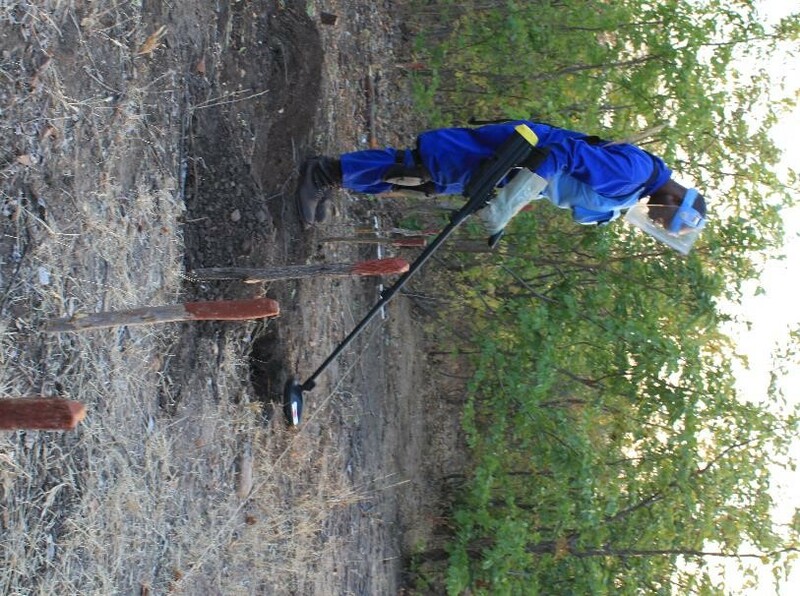 When the deminer declares an area cleared of metal, the section leader will re-scan the area with a metal detector. If the deminer has missed any metal, the deminer receives a warning. Too many warnings and the deminer is dismissed. At the end of each work day, all of the mines cleared that day are destroyed. The HALO Trust does not have approval from the Zimbabwean government to import or use explosives for demolition so it burns each mine. Each mine is placed in a metal box filled with flammable material, in this case sawdust soaked in flammable liquid. Section leaders ignite all of the mines at once. Eight were burned on the afternoon I was there. After the mines are destroyed, the teams pile back into the safari vehicles and head back to camp. At camp, the deminers get some lunch and relax. A television was brought in for the 2014 World Cup and while I was there the teams watched highlights from Copa America football tournament in Chile. All in a day’s (very good) work. Many thanks to Tom Dibb and the entire team at HALO-Zimbabwe for letting me tag along. 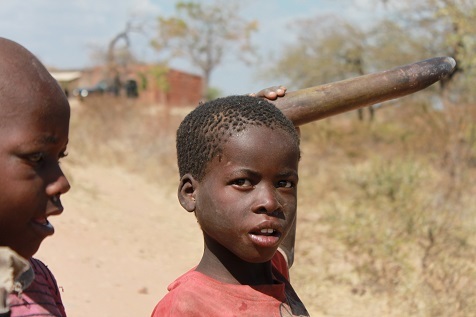 To learn more about HALO’s work in Zimbabwe, please visit their website. I spent the last two days as a guest of the fantastic HALO Trust, learning first-hand about their work on the northeastern border of Zimbabwe. The minefields here date back to the late 1970s during Zimbabwe’s liberation war and were laid by the Rhodesian government. In 1998 – 2000, Koch MineSafe, a commercial demining firm (which employed many of the same deminers currently working for HALO), cleared some of the landmines, but also left many still in the ground. The Rhodesian government laid landmines in three rows: a Cordon Sanitaire minefield with barbed wire and buried anti-personnel mines closest to the border; three layers of Ploughshare (or Ploughshear), a directional fragmentation mine, similar to the Claymore, linked to overlapping tripwires, with each Ploughshare protected by two “keeper” landmines to prevent tampering; a reinforcement minefield consisting of two rows of anti-personnel landmines. Koch cleared the Cordon Sanitaire landmines closest to the border and many of the Ploughshare landmines, but in most places left the reinforcement minefields (Koch’s contract covered clearance of the Cordon Sanitaire and two rows of Ploughshares). HALO is clearing all of the mines it finds, and during my visit I saw clearance of the reinforcement minefields and the third row of the Ploughshare minefield. The density of the minefields is such that HALO is clearing more than a thousand landmines a month (all anti-personnel mines), one of the highest clearance rates anywhere in the world. On the left, Ploughshare mines; Top Center and Top Right, South African-made R2M2 mines; Bottom Center and Bottom Right, Portuguese-made MAPS mines. Most of the Ploughshare mines detonated long ago, the only remnants are the stakes that held the mines and the keepers (Portuguese MAPS and either Italian-made VS50s [not pictured] or South African-made R2M2s). In the reinforcement minefield, all of the mines are the South African M2R2s, one of which I could see sitting on top of the ground, others are buried up to 20 centimeters. Because the mines have been here for so long, the impacts on the local communities are staggering. In one village in HALO’s working area, more than 20 persons suffered landmine injuries resulting in amputations. In another community, 14 cattle were lost in a single year. 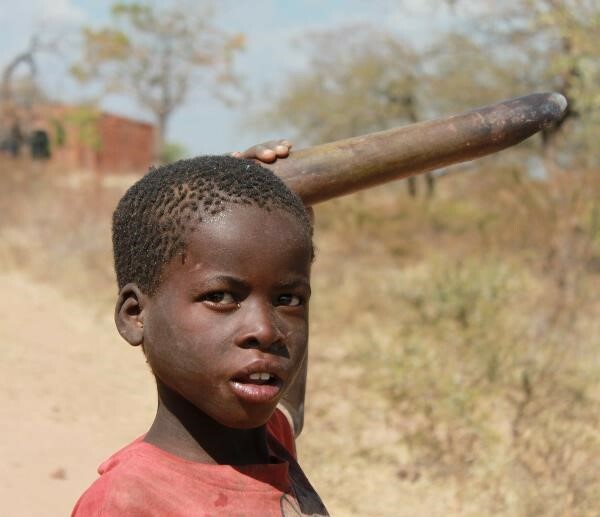 At the local primary school, 66 children from Mozambique crossed the minefields twice every day to attend classes. Map of HALO Trust’s working area (active sites in blue, cleared areas in green). The residents live in communities to the bottom left of the picture, separated from the minefields by the road. The Mukubura River, forming the border between Mozambique and Zimbabwe is marked in yellow. The communities are aware of the minefields. Elders lived in the area when the mines were planted and many remembered the clearance work done by Koch. All have stories of friends, family members or livestock killed or injured by mines. But, the best farmland in the region cruelly lies between the minefield and the Mukumbura River and the water holes are in the same place. Many paths of various widths crisscross the minefields and while villagers felt safe on the paths, HALO found landmines just steps away. Red circle marks were two landmines were found next to a heavily used track from the village to the watering holes by the river. HALO has worked with the communities to identify the minefields, and has also provided assistance to many survivors. 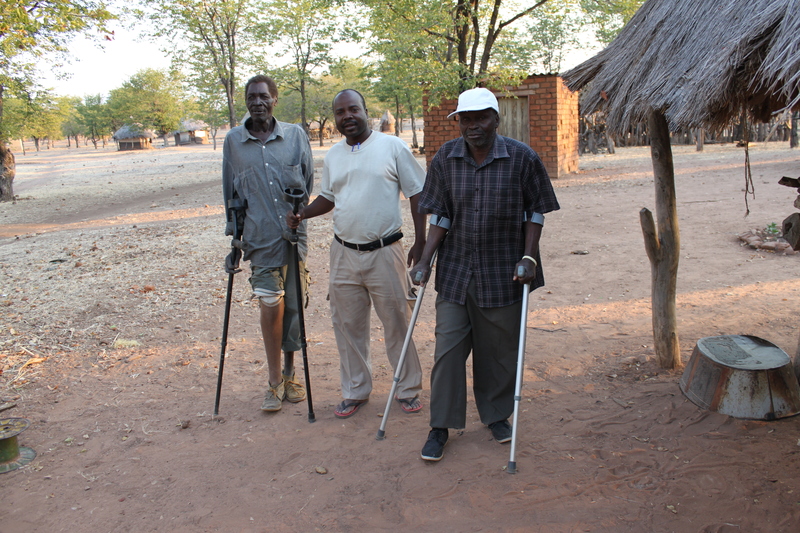 In addition to freeing up land for development and agriculture (many local headmen are eyeing the cleared fields for housing for their communities) and making the paths to and from the water holes safer, HALO has arranged for several amputees to receive new prosthetic limbs. For some survivors, these are the first limbs they have received in more than thirty years (or ever). Two survivors flank July, one of HALO’s senior staff. Both survivors have received artificial limbs thanks to HALO’s intervention. There is still much to be done. In addition to the HALO Trust, Norwegian People’s Aid is clearing minefields along the eastern border, around the city of Mutare, and the engineering division of Zimbabwe’s army is busy with the southeastern borders. Since 2013, the pace of clearance has increased immensely, but years more effort will be needed to clear the rest of the mines at the current levels of support. 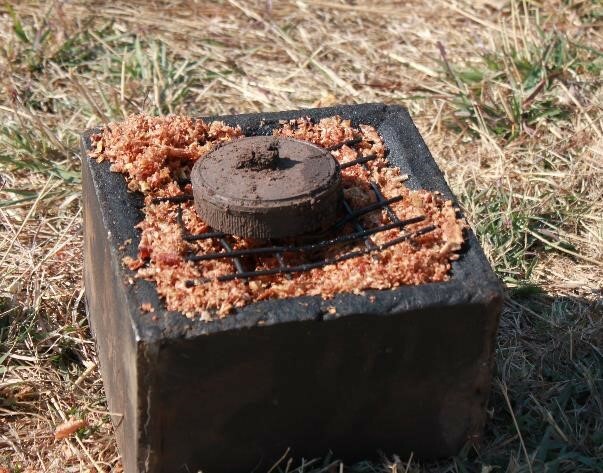 In case anyone was expecting a lull in mine action news following the Maputo Review Conference, July’s stories from the continent confirm that despite the positive news and outcomes from the Conference, landmines continue to take lives. They must have known that they were in for a long, protracted struggle because the Nigerian Police Forces have developed and unveiled a new landmine-proof vehicle for use in combating insurgents (All Africa). Too late to #bringbackourgirls, but maybe the Nigerian police can prevent future kidnappings. Three different landmine incidents occurred in the first week of July in the restive Mount Chaambi area along the Algerian border, killing at least four people and wounding six. In the first incident, four soldiers and two guardsmen were injured by a landmine when their vehicle drove over it near Kef (Tunisia Live). In the second incident, a civilian entered a closed military zone and died after stepping on a mine. There was no explanation for why the man entered the zone (AFP). 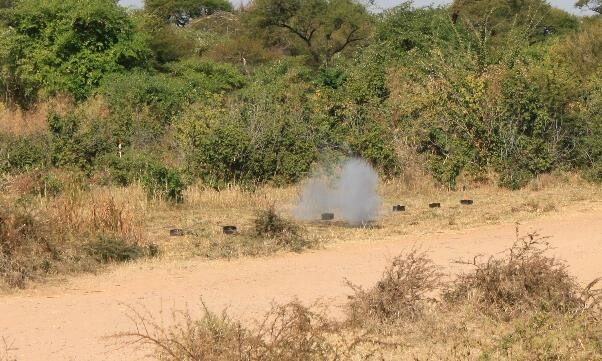 In the third incident four soldiers, and maybe a civilian, were killed by a landmine, also near Kef (All Africa). Tunisian authorities blamed all casualties on Islamist forces who have been using Mount Chaambi as a base from which to threaten the government. Vice magazine and the War is Boring blog both profiled the Moroccan berm that splits the Western Sahara territory with 7 million landmines and has caused hundreds, if not thousands of casualties. Both pieces addressed the ongoing conflict and how Islamists have been trying to recruit members from the youths living in the refugee camps on the eastern side of the berm. Worth noting that Mohamed Abdelaziz, the President of Sahrawi Arab Democratic Republic (SADR) which is the government in-waiting for Western Sahara, has been in power since 1976, trailing only Cameroon’s Paul Biya as the longest-serving leader of a country. 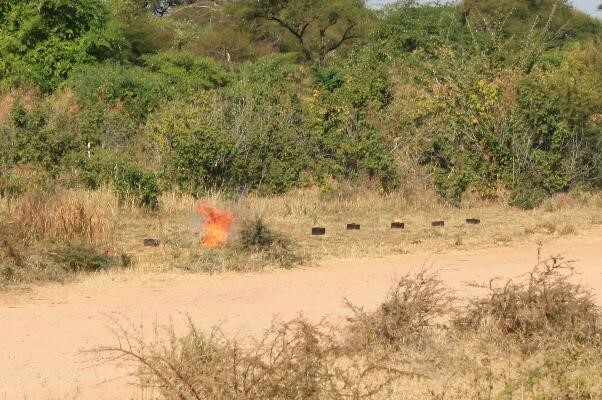 Angolan authorities reported out on landmine clearance progress in Cuanza Sul, Benguela, Cunene and Moxico Provinces. Removing and destroying thousands of explosive remnants of war, the country continues to make slow progress towards becoming mine-free. In Cuanza Sul, almost 8 million square meters were cleared of mines over 18 years and now the focus is shifting to secondary and tertiary roads (All Africa). 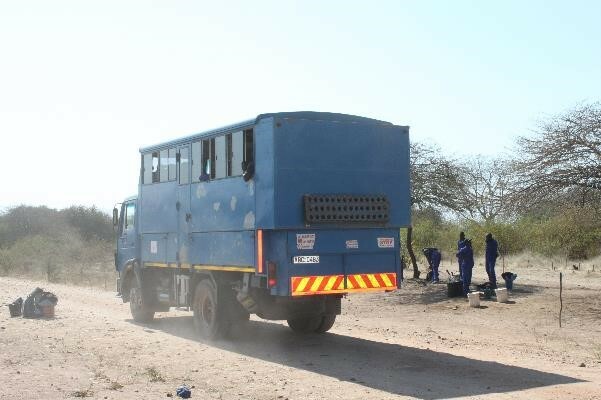 In Benguela, explosive items that had been stored for more than a year were finally destroyed. Prompt (certainly more prompt than seen in Benguela) destruction of stockpiled munitions is necessary to prevent accidentally discharges of munitions (All Africa). With the support of Mines Advisory Group, 1.5 million square meters in Moxico Province have already been cleared in 2014. Landmine clearance tasks have focused on access roads to allow free movement and the proposed high voltage lines for a future hydroelectric dam (All Africa). 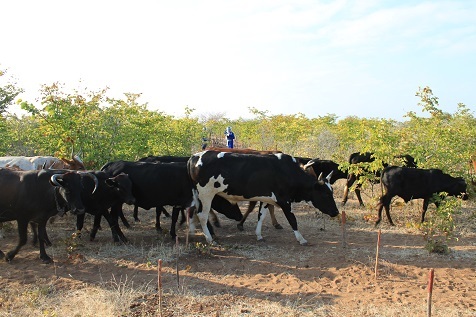 Cunene province’s agricultural outputs will be boosted by the clearing of farmlands and already half a million square meters have been cleared (All Africa). 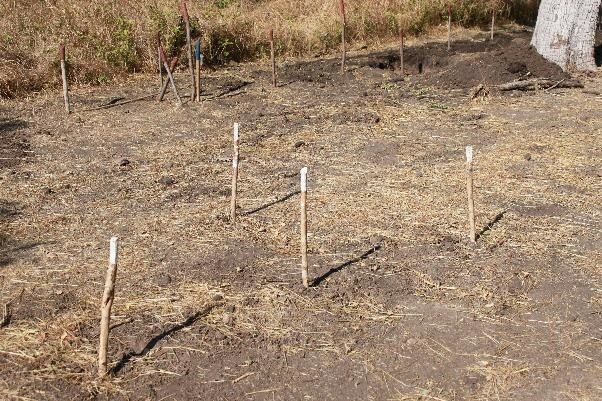 The tensions between former rebel group RENAMO and the government of Mozambique continued in July which delayed landmine clearance in the Chibabava district of Sofala province. 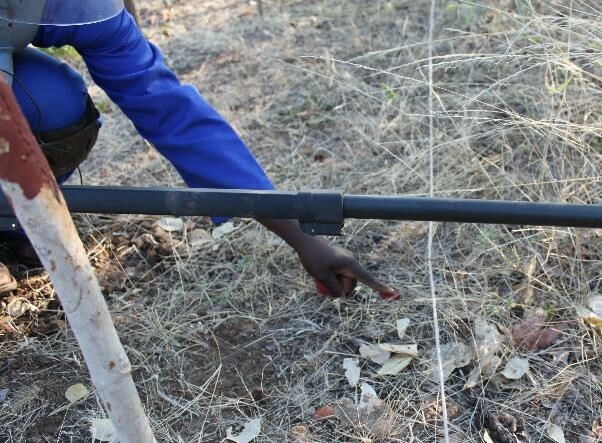 The government of Mozambique had hoped to finish all landmine clearance in 2014 and RENAMO’s actions threaten that timeline which means that Mozambicans may continue to live with the threat of landmines longer than was necessary (All Africa). The director of the Zimbabwe Mine Action Centre (ZMAC), Col. Mkhululi Ncube testified before the Zimbabwean Senate’s Thematic Committee on Peace and Security, shortly after he participated in the Maputo Review Conference. Col. Ncube told the Committee that over 3,600 people have been killed or injured by landmines since 1980 and some 800,000 people have been economically affected by the continuing presence of landmines along the country’s borders. Landmines have hampered the tourism and agricultural industries in Zimbabwe as well as killing thousands of herd animals. 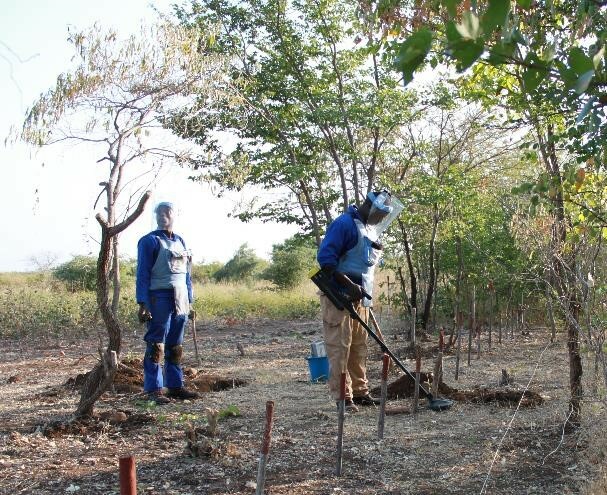 Martin Rushwaya, representing the Ministry of Defence, said that as much as US $100 million may be needed to clear all of the landmines from the country. In recent years most landmine injuries have been attributed to deliberate tampering with explosives by people trying to extract non-existent red mercury from the devices. In response ZMAC has been incorporating messages about red mercury in its mine risk education materials. 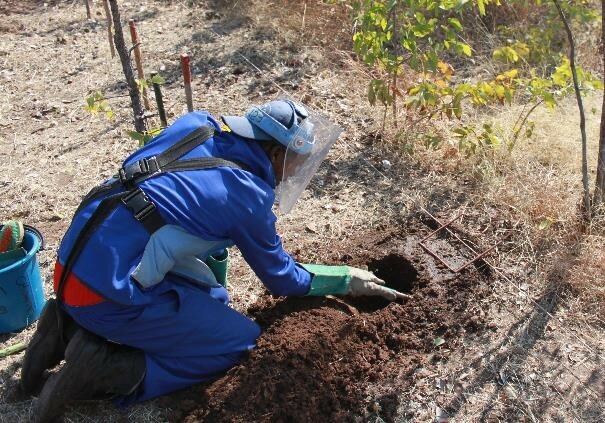 On the positive side, the minefield surrounding the Kariba Hydroelectric Power Station, the very first minefield laid in Zimbabwe when it was still a British colony, has been cleared and thousands of landmines have been cleared since work resumed in earnest in 2012 (All Africa; News Day; Zimbabwe Mail). 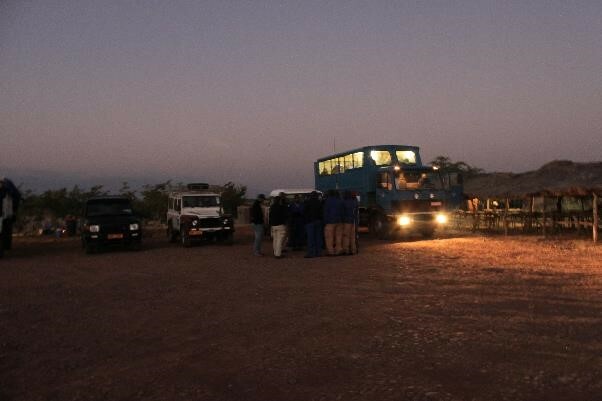 The Higleg area of Sudan’s West Kordofan state has been declared free of landmines. Heglig was the site of fighting in 2011 between Sudan and South Sudan but has since been cleared of mines (Sudanese Online). In North Darfur, heavy rains have exposed landmines laid by the government of Sudan according to one of the rebel groups, the Sudan Liberation Movement, Abdel Wahid El Nur. The landmines were spotted near Kutum town and were believed to be intended to “hamper movement of the Darfur resistance forces” (All Africa). In response to the mine risk throughout the country, Sudan’s National Demining Center launched a mine risk education campaign in the five Darfur states and in Blue Nile state with the support of national and international organizations. The campaign will integrate mine risk messages into school curricula (GM Sudan). The Development Initiative has delivered mine risk education messages to over 170,000 Somalis and in the process provided job skills and education opportunities for the Somali staff working for the project (Devex). Towards the end of the month, Mogadishu’s mayor narrowly avoided a possible assassination attempt when his vehicle drove over a landmine. The mayor and his security detail were protected from the blast by their vehicle but at least one passerby was killed and another injured by the blast (Sabahi). In late June, Stephen Beecroft was confirmed as the US Ambassador to Egypt. While Amb. Beecroft will undoubtedly have his hands full with issues related to the US relationship with Egypt and the assaults on democracy and human rights emanating from the current regime, we ask the Amb. Beecroft remember his time served in the State Department’s Bureau of Political-Military Affairs where he was involved with landmine clearance. Egypt has the greatest number of landmines of any country in Africa, almost as many as all other African countries combined, and could use additional assistance to clear this lingering threat (All Gov). The United Nations Mine Action Service (UNMAS) has been active in Northern Mali for some time, responding to the threats of landmines and ERW which did not exist prior to the Islamist takeover of the region. Since March 2012, over one hundred civilians have been killed or injured by landmines and ERW, more than half of them children; almost 250 soldiers from the various national and international forces have been killed or injured since January 2013. UNMAS recently trained explosive ordnance disposal companies from Cambodia and Nepal who are serving in the United Nations peacekeeping force in Mali (MINUSMA). Two of the Cambodian peacekeepers were injured by an anti-personnel mine when their vehicle drove over the mine. Because it was an anti-personnel mine and not an anti-vehicle mine, the injuries were severe but not life-threatening. As the head of the Cambodian team in Mali put it, the driver’s “leg injury was not serious enough for it to be cut off and now he is in hospital in Mali” (Phnom Penh Post). One point to make about the peacekeepers: Nepal and Cambodia, especially Cambodia, suffer from contamination from landmines and other ERW. 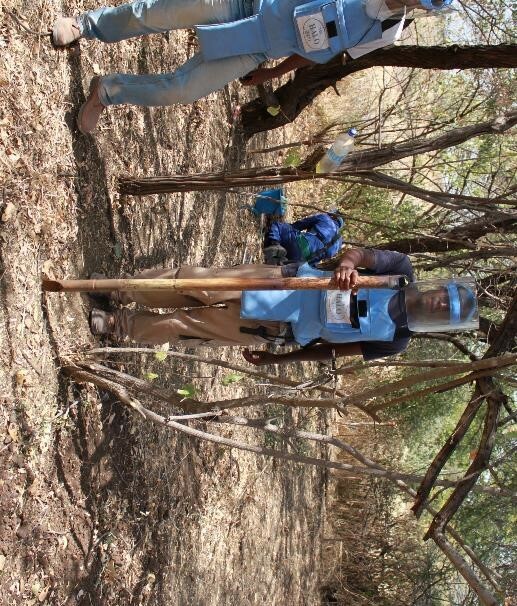 Shouldn’t these trained deminers be working to clear their own countries of landmines before assisting others? Landmine survivor, advocate and director of the Uganda Landmine Survivors Association (ULSA), Margaret Arech Orech was selected by the Joan B. Kroc Institute for Peace and Justice at the University of San Diego as a 2014 Women PeaceMaker. As one of four such PeaceMakers, Ms. Orech will serve a three-month residency at the University and contribute to conversations about the role of women in international peacebuilding. Zambia has declared itself to be free of landmines, but the United Kingdom’s Foreign and Commonwealth Office (FCO) recently updated its travel advice for Zambia saying “There is a risk of landmines in remote areas near the borders with Angola, Mozambique and [the Democratic Republic of Congo].” The FCO is not clear about whether or not it believes the landmines are in Zambian territory or if it is just warning travelers about the presence of landmines in the neighboring states along the border. If the FCO has evidence of landmines in Zambia, the FCO should share than knowledge so the government of Zambia can respond (Foreign and Commonwealth Office). Because of Zambia’s experience in clearing its territory of landmines and ERW, the Foreign Minister, Harry Kalaba, offered his nation’s assistance to Vietnam to help Vietnam address its own landmine and ERW threat. The announcement came during Kalaba’s visit to Hanoi and is part of an effort to expand cooperation between the two countries (Vietnam News). South Africa’s parastatal company, Mechem, is one of the largest demining firms in Africa. In an article describing Mechem’s growing portfolio, the company’s general manager reported that Mechem provides bomb disposal services for the African Union Mission in Somalia (AMISOM) beginning July 1 and Mechem’s teams are destroying an average of a ton of ERW in Libya each month. However, Mechem also reports that the civil war in South Sudan has severely restricted activities there and Mechem is only able to do emergency work at the moment. Mechem also warned of the “strong possibility” of new landmine usage in South Sudan (Defence Web). In a bit of irony, Norway, a leader in mine action around the world and a strong champion of the Mine Ban Treaty, twice evacuated a kindergarten in Karmøy in southwestern Norway after two landmines, presumably leftover from World War II, were discovered on the nearby beach in separate incidents in the same week. Both mines were quickly destroyed, but their presence serves as a reminder that landmines are a global issue (The Local).